What’s old is unfortunately new again: Recently, two military officials said that we should be getting ready for a war in space, a sentence I am ashamed to write in the year 2017. Their advice was seemingly bolstered by a Hill article penned by two national security experts this week, which reminded Americans that North Korea could in theory use a satellite weapon to send an electromagnetic pulse over the United States, triggering widespread blackouts and ultimately, societal collapse. It seems like all those Cold War fears Baby Boomers have repressed for decades are finally getting their chance! While Richard and Goldfein’s comments might seem out of the blue, there’s actually a long history of policy—and action—about space as a battleground. In 1967, toward the beginning of the Space Race, the United Nation’s Outer Space Treaty banned the use of nuclear and other weapons of mass destruction from being used anywhere in outer space. 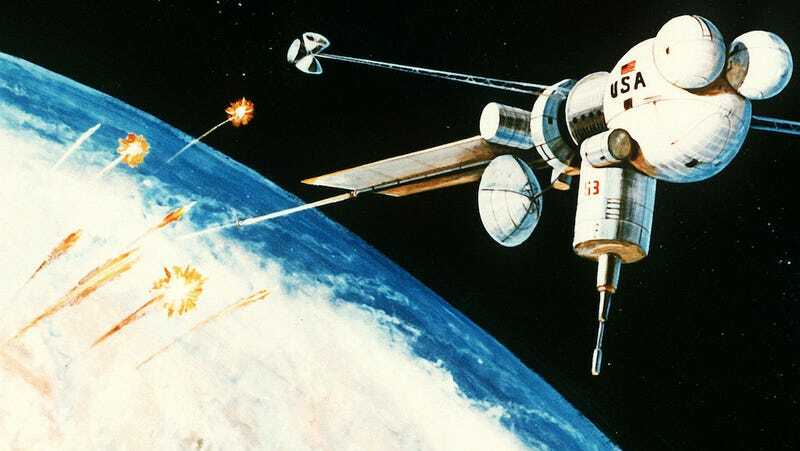 But that didn’t stop Cold War powers from propagating the idea that an all-out space war was nigh—in 1983, President Ronald Reagan introduced the Strategic Defense Initiative (SDI), also known as Star Wars, which was a plan to launch an anti-ballistic missile system into space to protect Americans from a Soviet attack. Similarly, Russians entertained the idea of creating “suicide satellites,” which were essentially spacecrafts with rapid-fire cannons attached to them. Like SDI, the idea was eventually scrapped. Then, in the early 2000s under the tenure of President George W. Bush, the notion of bringing our battles beyond Earth resurfaced again. Things got a little more real in 2007, when China used an antisatellite weapon from Earth to blow apart one of its own weather satellites in space. Shortly after, the New York Times reported that arms control experts called the test a “troubling development that could foreshadow an antisatellite arms race.” Once president Obama took office, there was a short cooling down period until 2013, when China launched a rocket that was ostensibly for a science mission; reportedly, some researchers were concerned that this was a practice run for future antisatellite weapons. Gizmodo has reached out to the Department of Defense for comment and will update this post if and when we hear back. So while the fear of a space war is nothing new, this perennial anxiety doesn’t get any easier to deal with. While recent comments from military officials might seem aggressive and sort of alarmist, Freese said that all things considered, they’ve dialed it back quite a bit. To be fair, a shooting war in space could be disastrous for astronauts aboard the International Space Station (ISS), communications satellites, and by extension, the rest of us here on Earth. The human toll from an EMP attack that blacks out the electrical grid is also no laughing matter—although claims that such an attack would kill 9 out of every 10 Americans may be a gross exaggeration.